WW1 Reenactments Equipment : Great War Tommy WW1 Documents, Paperwork : Replica WW1 full colour Postcard No. 3. 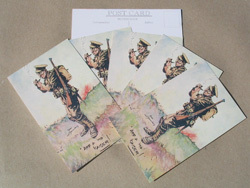 WW1 Reproductions and WW1 Reenactors Equipment / Kit - Replica WW1 full colour Postcard No. 3. Replica WW1 full colour Postcard No. 3. "Arf a 'Mo', Kaiser!" Tommy's involvement in the battle is delayed as he lights his pipe! Drawing by Bert Thomas,(circa 1915), postcards originally sold in aid of the Soldier's Tobacco Fund. Simplified period style reverse. Price per 10.